Walking and cycling are the most human forms of transportation, and that’s what makes them so fascinating. A person on foot or on a bike has limitless ability to travel through cities and communities, and I’m committed to better understanding these needs and enabling them. I’ve studied human transportation in action all over the world, from Amsterdam to Australia, and Bangladesh to Bali. 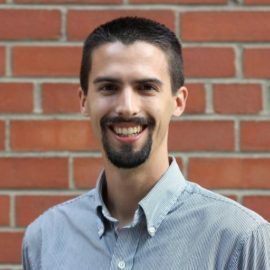 Matt is a transportation engineering graduate and designer with a focus on the details and a keen eye for the social science of transportation. Matt previously worked as a planner for Metrolinx, where he led initiatives to improve walking and cycling access to commuter rail stations, including authoring a new design standard for on-site cycling infrastructure, producing design concepts and a business case for secure bike parking facilities, and providing walking and cycling subject matter expertise to the development of new station site plans. As initiator and project manager for these initiatives, Matt consulted extensively with industry peers, technical standards, and a broad range of Metrolinx stakeholders including operations, planning, marketing, and construction groups. Matt is a self-starter with experience in writing, event planning, and public speaking. In 2018 he co-founded BIKE MINDS, a unique cycling advocacy event series where positive and inspiring bike-related stories are shared in front of a live audience.